This famous recipe is very easy to do and there is no need for cooking in the oven . 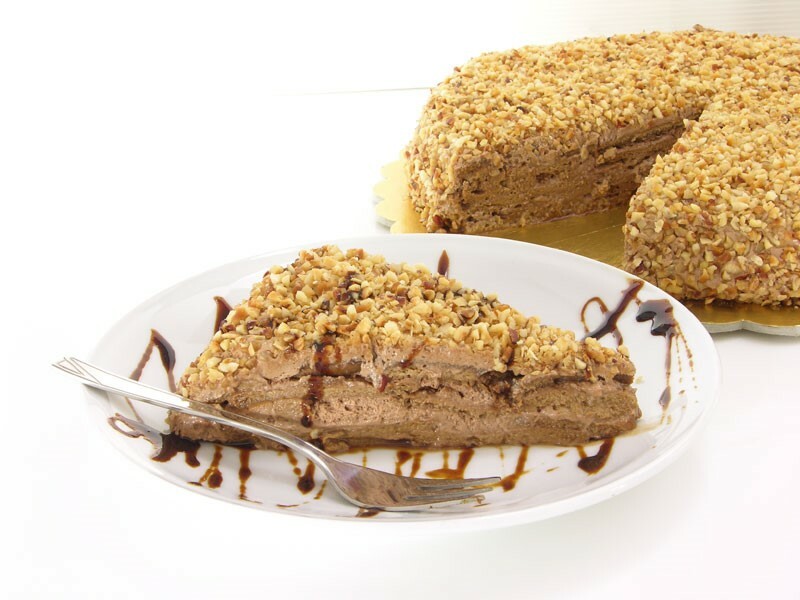 With its delicious taste this gateau is ideal as a desert and also for tea time. Melt 2tbsp coffee in 2tbsp hot water and allow to cool. Then with an electric mixer, mix together the cold melted coffee with the topping mix powder, the 300ml milk, cocoa powder and drinking chocolate powder until the mixture thickens. In another bowl pour in the boiling water and add in the remaining 3tbsp coffee and if a sweeter taste is desired add the optional 3tbsp of castor sugar. Allow the coffee to cool, then start dipping the biscuits one at a time in the coffee, then lay them in the spring form pan to cover the bottom. Make a layer of topping mix and keep on adding alternate layers of the dipped biscuits and cream till the top of the pan. Let it stand in the fridge overnight and then remove from pan, and place upside down on a serving dish. With an electric mixer, beat the remaining topping mix and cover the top and sides, then sprinkle the crushed hazelnuts to decorate.